ASTANA – As the world and Kazakhstan mark the 25th anniversary of the closure of the Semipalatinsk Nuclear Test Site on August 29, The ATOM Project is calling for a moment of silence on that day to honor all victims of nuclear weapons testing. Kazakhstan suffered more than 450 Soviet nuclear weapons tests at the Semipalatinsk site beginning August 29, 1949 and ending on that date in 1991 when Kazakhstan’s first and current President Nursultan Nazarbayev, responding to the voices of the Kazakh public, shut down the site. Those 42 years of testing, however, inflicted great suffering on the Kazakh people and environment. Tests negatively affected the health of more than 1.5 million Kazakh citizens including many who, to this day, in the first and the second generations, suffer early death, lifelong debilitating illness and horrific birth defects. Vast areas of the region surrounding Semipalatinsk, roughly the land size of Germany, were contaminated in one degree or another and are now just beginning to come back to life. Following the closure of the Semipalatinsk site, Kazakhstan soon also renounced what was then the world’s fourth largest nuclear arsenal and has since become a world leader in the fight to permanently end nuclear weapons testing and, ultimately, to build a nuclear weapons free world and. In 2012, the country launched The ATOM Project, a global initiative to help bring into force the Comprehensive Nuclear Test Ban Treaty (CTBT) and show world leaders that the public worldwide is united in its desire to eliminate the nuclear weapons threat. And on December 2, 2009, at Kazakhstan’s initiative, the United Nations unanimously declared August 29 the International Day against Nuclear Tests. “The resolution calls for increasing awareness and education ‘about the effects of nuclear weapon test explosions or any other nuclear explosions and the need for their cessation as one of the means of achieving the goal of a nuclear-weapon-free world.’ The resolution was initiated by the Republic of Kazakhstan, together with a large number of sponsors and cosponsors with a view to commemorate the closure of the Semipalatinsk Nuclear Test site on 29 August 1991. The Day is meant to galvanize the United Nations, Member States, intergovernmental and non-governmental organizations, academic institutions, youth networks and the media to inform, educate and advocate the necessity of banning nuclear weapon tests as a valuable step towards achieving a safer world,” according to a statement by the UN. This August 29, marking the 25th anniversary of the closure of the Semipalatinsk site, Kazakhstan is calling for a moment of silence to honor nuclear weapons testing victims and will be hosting, along with Parliamentarians for Nuclear Non-Proliferation and Disarmament (PNND) in its capital city Astana, a major conference focusing on further steps towards a world free from the threat of nuclear annihilation. The conference will be addressed by President Nazarbayev and will gather leading parliamentarians, prominent political leaders, diplomats and disarmament experts, as well as religious leaders and civil society representatives from around the world to discuss further steps towards global nuclear nonproliferation and disarmament. On August 29 four years ago, Kazakh President Nursultan Nazarbayev addressed a major international parliamentary conference in Astana and launched The ATOM Project as a way to generate global popular support for a permanent end to nuclear weapons testing and, ultimately, the abolition of nuclear weapons. 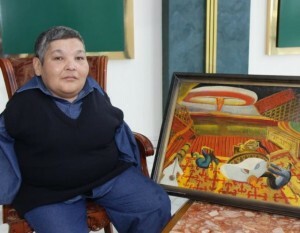 The ATOM Project Honorary Ambassador and anti-nuclear weapons activist Karipbek Kuyukov, who is an artist born without arms. Kazakhstan knows well those catastrophic human consequences. From 1949 to 1991, the USSR conducted more than 450 nuclear weapons tests at the Semipalatinsk nuclear test site in eastern Kazakhstan, causing the illness and premature death of more than 1.5 million people and contaminating a huge area. In the second part of the 20th century, nuclear tests were conducted by the Soviet Union, the United States, China, France and Britain as they developed their nuclear arsenals, as well as India and Pakistan. And as recently as last January, Democratic People’s Republic of Korea, defying United Nations Security Council resolutions, drew international condemnation when it conducted another nuclear weapons test. In a statement dedicated to the fifth annual observance of the International Day Against Nuclear Tests in 2014, UN Secretary General Ban Ki-moon noted the importance of focusing the world’s attention on ending nuclear testing. “On this International Day Against Nuclear Tests, the international community reaffirms its commitment to secure the entry into force of the Comprehensive Nuclear-Test-Ban Treaty (CTBT), which would prohibit all nuclear explosions. This would mark a welcome step toward a world without nuclear weapons,” Ban said in a statement. Ban also called on countries themselves to act unilaterally to end nuclear weapons testing. “I also call on all countries to refrain from nuclear tests, the use of new nuclear weapons technologies or any action that would defeat the object and purpose of the CTBT,” Ban added. The ATOM Project is an international petition campaign designed to unify support for an end to nuclear weapons testing and world free from nuclear weapons. The Project puts a human face on this global issue by telling the stories of the survivors of nuclear testing. To this day, children are born with severe deformities, illnesses and a lifetime of health challenges as a result of exposure generations ago to nuclear weapons tests. “We hope the August 29 Global Moment of Silence will bring the world one step closer to that goal,” Kuyukov, himself a second generation survivor of nuclear weapons tests and a famous armless artist, said.